WASHINGTON — Senate Republicans and President Trump share the same inclinations when it comes to one of the worst habits in our politics: Placing ideology and partisanship above the health of our institutions. While Trump is destroying the honor and reputation of the presidency, Senate Republicans are doing all they can to destroy the legitimacy of the United States Supreme Court. When it comes to this last line of appeal in our legal system, the GOP has treated court appointments the same way machine politicians once treated jobs in city sewer departments: If you have the clout, you use it to place your people. Period. And on this one, the machine hacks hold the higher moral ground, because the consequences of the Brett Kavanaugh Hustle and the Merrick Garland Mugging are much greater than the costs of giving somebody’s brother-in-law the task of fixing the pipes. Conservatives are willing to bend and break the rules, violate decorum and tradition, hide information and push Judge Kavanaugh through at breakneck speed. They want a Supreme Court that will achieve their policy objectives — on regulation, access to the ballot, social issues, the influence of money in politics and the role of corporations in our national life — no matter what citizens might prefer in the future. This is not fantasy. The Roberts Court again and again has swept aside precedent to foil the wishes of the elected branches of our government on the Voting Rights Act, campaign finance reform, environmental rules and a host of other issues. We are witnessing conservative judicial activism on a scale not seen since the New Deal era brought about a crisis over the Supreme Court’s authority. Kavanaugh will push the court much further right. Everything we know about him points to a man who is fierce and unapologetic in his partisanship and relentless in advancing his ideology. His confirmation will be the equivalent of handing the court over to the Heritage Foundation and the legal staff of Koch Industries. It is characteristic of hypocrites to be unctuous and judgmental. How else to describe the attitudes of the GOP senators rushing Kavanaugh to the bench, and their defenders in the conservative legal academy who long to undo 75 years of court precedents? Democrats on the Senate Judiciary Committee are legitimately outraged over the haste with which Republicans are forcing Kavanaugh through and the cover-up of mountains of documents from his past. When Elena Kagan was nominated to the Supreme Court by President Obama in 2010, all but a very small proportion of the records from her extensive service in the executive branch were turned over to the Senate. In Kavanaugh’s case, tens of thousands of documents are being held back through a vetting process run by partisans for partisan purposes. And when Democrats on the Judiciary Committee howled about rigged hearings and did whatever they could to bring more information to light, Republicans primly accused them of lacking civility. Imagine you’re punched in the face, and when you complain loudly and raise your arm to shield yourself, you’re called a brutish norm-breaker. The talk of civility is laughable in light of the Republicans’ refusal to give Garland — a judge whose quality Kavanaugh himself extolled — either a hearing or a vote. That was not just incivility. It was an abuse of power reflecting the political right’s determination to seize control of the court by any means necessary. Two Republican senators could derail their party’s court packing, Lisa Murkowski of Alaska and Susan Collins of Maine. Moderates and progressives appreciated their willingness to break with their party in previous instances, particularly in saving the Affordable Care Act. 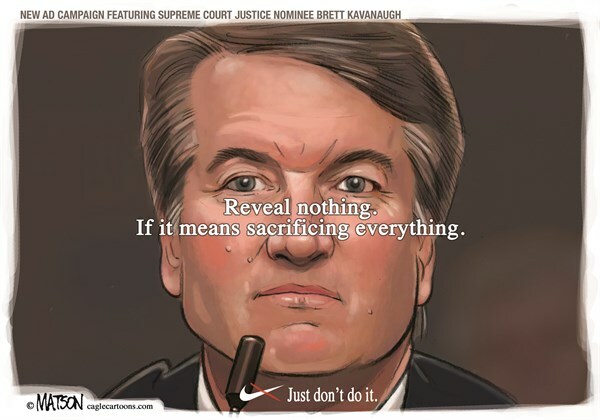 But by voting to confirm Kavanaugh they would be ratifying everything in politics they claim to be against. This is not just about their pledges to protect the right to choose on abortion. It’s also a test of whether they mean what they say about wanting politics to be less partisan and more consensual. Caving into the power brokers and ideologues on this will follow them for the rest of their careers. If the Trump era produces a backlash so strong that a Democratic president and Congress pass breakthrough economic and social policies, conservatives will count on their court majority to block, dismantle or disable progressive initiatives. And short of impeachments or court-packing, there will be nothing officials elected by the people will be able to do about it.